The Bantam Rep Selects competed in the Canadian Hockey Enterprises Canadian Cup in Chambly, QC this weekend – and came home with a Gold medal! The Selects finished with a 1-2 record after the round robin, losing a close game to the Boston Stars Red and the other to the Jersey Penguins. Their win was against the Boston Stars White. They had a chance to redeem themsleves, twice. In the semi-final game against the Boston Stars Red, the Selects pulled off a win in OT after giving up a 2-0 lead. That gave them their second chance at redemption, this time against the Jersey Penguins in the Gold medal game. In another OT thriller, the Selects came out on top – and won the Gold medal. 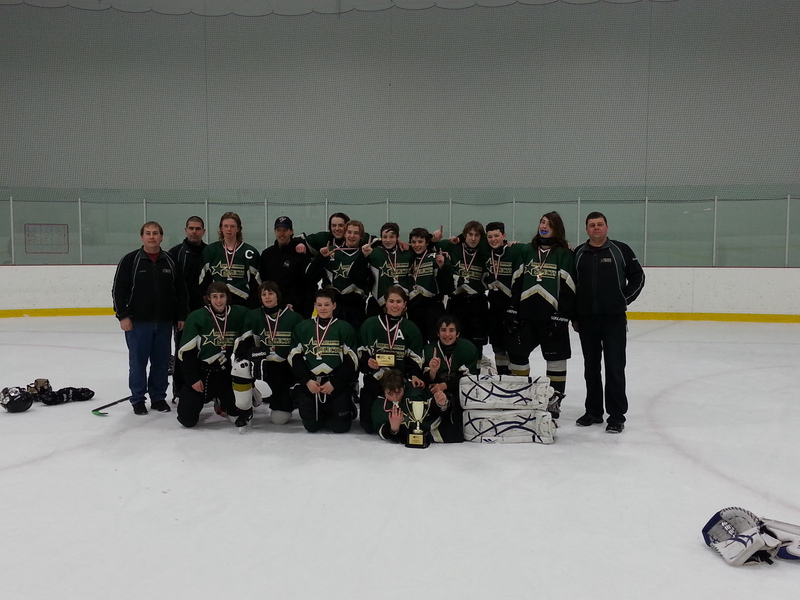 The 2012-2013 Bantam Rep Selects become the first team from SSMHA to win a Gold medal at a CHE tournament. This entry was posted in Team News and tagged B Rep, Bantam, Champs, Gold, south stormont minor hockey, Tournament. Bookmark the permalink.